Lunar Asymmetry - Were Lunar Maria created by impacts from asteroids whose speed was increased by Earth's Gravity? Figure 1. Image of the Moon from the 1994 Clementine mission. The Luna 3 Soviet probe took the first photographs of the far side of the Moon on October 7, 1959. Additional missions to the Moon, such as Clementine, provided lunar images (Figure 1) that show that the near and far side of the moon have very different geological characteristics. The near side has numerous dark large basaltic deposits that were named maria by the ancient astronomers who thought that they were seas. The far side has a surface dominated by bright deposits of anorthosite (Peterson, et al., 1999) that are heavily cratered, and there are only a few maria, such as Mare Moscoviense. The question of why there are so many mare basalts on the near side, but so few on the far side has been the subject of study by many lunar scientists. The theories for the formation of the lunar maria can be divided into impact-based and geology-based explanations. The impact-based theories provide a plausible explanation for the circular shapes of the maria and the gravitational anomalies known as mascons that are found in the centers of the maria. The hypothesis that the lunar maria are the result of impacts by small Earth satellites proposed by Gilbert (1893) has been refined to postulate that collisions between the Moon and small external Earth satellites traveling in the same direction and in roughly the same orbital plane as the Moon would primarily take place on the far side of the Moon as the Moon spiraled away from the Earth, and that if the present Earth side of the Moon were actually the far side of the Moon at the time during which most satellite impacts were occurring, the asymmetric distribution of maria would be explained (Metcalfe and Barricelli, 1970). The creation of the maria by impacts from asteroids with parabolic orbits near the Earth-Moon system was considered by Barricelli and Thorbjornsen (1978), but they rejected this idea in favor of collisions from Earth satellites due to the asymmetric distribution of the impacts. Geology-based theories about the differences between the near and far side of the Moon include variations of crustal thickness that modulate the amount of magma that reaches the surface (Thurber and Solomon, 1978), tidal force mechanisms (Smith J. V., 1970), tilted convection in the lunar magma ocean (Loper and Werner, 2002), rapid crystallization of the magma ocean on the far-side that created an asymmetric core (Wasson and Warren, 1980), and gravitational instability during the fractionation of an anorthositic crust (Parmentier, et al., 2002). The Giant Impact Hypothesis proposes that the Moon was created from the debris ejected from a collision between the young Earth and a Mars-sized body 4,450 million years ago (4.45 Ga). (Hartmann and Davis, 1975; Cameron and Ward, 1976) The strong tidal forces between the Earth and the newly formed Moon caused the rotation of the Moon to become synchronized with its orbital period within 3.2 million years (Peale, 1977). From that time, the Moon's period of rotation around its own axis became the same as the time to revolve around the Earth. Tidal deformation shaped the Moon into a triaxial ellipsoid. 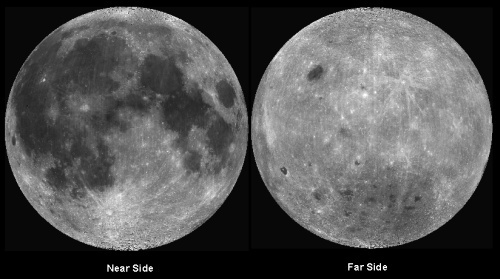 The forces that caused tidal locking resulted in a farside crust almost twice as thick as on the nearside, and the Moon's center of mass was displaced toward the Earth and away from the Moon's center of figure by 1.982 kilometers. The orientation of the Moon with respect to the Earth may be partly due to the distribution of dense lavas in the low-lying basins of the nearside which cause the heavier side of the Moon to always face the Earth (Melosh 2011, p34). Three hundred and fifty million years later, from approximately 4,100 to 3,800 million years ago, a large number of asteroids started impacting the inner planets of the solar system. 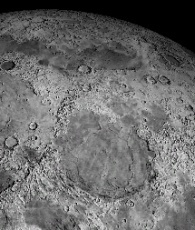 The period of high impacts, the Late Heavy Bombardment, corresponds to the time of the Lunar Cataclysm during which 80% of the Moon's crust was resurfaced by large impacts (Cohen et al., 2000). The planetary impactors are thought to have been asteroids that were dynamically ejected from the main asteroid belt and left a cratering record on Mars, the Earth, the Moon, Venus, and Mercury (Strom et al., 2005). It is recognized that accretion played a major role in building the planets and the Moon (Zahnle, et al., 2007), so it is reasonable to postulate that the Lunar maria are the results of impacts. The Lunar basins Imbrium (3.85 Ga), Serenitatis (3.89 Ga), Crisium (3.89 Ga), and Nectaris (3.90 Ga/3.92 Ga?) have been independently dated (Ryder et al. 2000) and these dates cluster around 3.9 Ga which coincides with the Late Heavy Bombardment. Some of the asteroids could have passed close enough to the Earth to increase their speed and be diverted toward the Moon. The Gazetteer of Planetary Nomenclature from the USGS (Gazeteer database) lists only 20 maria on the near side of the Moon, so it is not inconceivable that out of the large number of asteroids that approached the Earth during the Late Heavy Bombardment, twenty big ones would have had just the right trajectory to receive a gravitational boost from the Earth and impact the moon with increased speed. This paper explores the idea that the maria are the result of impacts by asteroids that came close to hitting the Earth and were deflected toward the Moon. The speed of the asteroids was increased by the gravitational field of the Earth at a time when the Moon had a thin crust and the lunar interior was still hot. A gravity assist or slingshot maneuver is used to change a spacecraft's velocity relative to the Sun. (van Allen, 2003) In December of 1973, the Pioneer 10 spacecraft approached Jupiter and used the gravitational pull of the planet along its orbit to increase its velocity sufficiently to escape the solar system. A gravity assist basically transfers some of the orbital velocity of the planet to the spacecraft. A spacecraft will gain speed if it approaches a planet from its trailing end (a direct gravity assist), whereas it will lose speed if it approaches the planet from its leading end (a retrograde gravity assist). Mariner 10, launched in 1973, used a retrograde gravity assist from Venus to slow down in order to reach Mercury. These same principles apply to an object traveling from the asteroid belt toward the Sun as it approaches the gravitational field of the Earth. 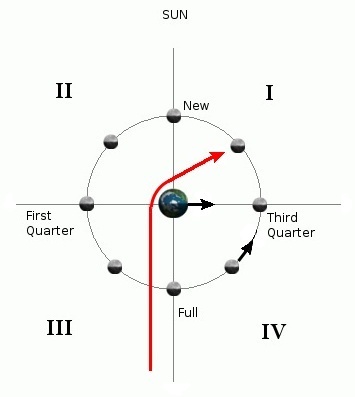 Figure 2 illustrates the Earth-Moon system and the trajectory of an asteroid deflected by the Earth's gravity (in red). Asteroids deflected by the Earth toward the Moon can only hit the near side of the Moon due to tidal locking. Since the Moon and the Earth are both traveling together around the Sun, a gravity assist by the Earth cannot take full advantage of the Earth's orbital speed of 29.78 km/sec. to increase the impact speed on the Moon, although the speed of the asteroid relative to the Sun could be increased or decreased by great amounts (Minovitch, 2011). The speed of the Earth around the Sun is about 30 times the speed of the Moon around the Earth (1.023 km/sec). This means that the speed of the Moon around the Sun will vary between about 103.4% and 96.6% of the speed of the Earth around the Sun. An asteroid following the trajectory illustrated in Figure 2, when the Moon is travelling against the trajectory of the Earth, would enable the asteroid to increase its relative impact speed by two to three percent of the Earth's orbital speed which would be approximately 0.6 to 0.9 km/sec. Figure 2. A gravity boost from the Earth can increase asteroid impact speed. Due to tidal locking, these more energetic impacts hit only the near side of the Moon. The gravitational field of the Earth can increase the velocity of asteroids while they are within the Earth's gravitational sphere of influence. The Hyperbolic excess velocity of an asteroid leaving the Earth is always exactly equal to the hyperbolic velocity coming in. The Earth's Sphere of Influence (SOI), where the Earth exerts the primary gravitational influence, has a radius of 925,000 km. An asteroid entering the Earth's SOI would gain speed from the gravitational pull of the Earth until it reaches the periapsis of its trajectory. The gain in speed due to the Earth's attraction would be approximately 3 km/sec. Having traveled in a hyperbolic trajectory, the asteroid will then slow down as it climbs out of Earth's gravity well until it exits the SOI, at which point the asteroid will have the same hyperbolic velocity relative to the Earth as it had when it entered the SOI. However, if the asteroid were to collide with the Moon, which is at a distance of 384,400 km from the Earth and well within Earth's SOI, the asteroid will still have excess speed over what it had when it entered Earth's SOI. In addition, since the asteroid is traveling directly toward the Moon, it will get an additional increase in speed from the gravitational pull of the Moon as it enters the Moon's SOI which extends to 66,000 km from the Moon (Figure 3). The excess speed while the asteroid is within the Earth's SOI corresponds to a "gravity boost", and it is different from the gravity assist for interplanetary trajectories because it only involves the gravitational forces within the Earth-Moon system rather than the orbital speed of the Earth relative to the Sun. When calculating the speed of asteroid collisions on the Moon for the creation of the maria, it is necessary to take into consideration that during the Late Heavy Bombardment the Moon orbited at approximately 282,000 km from the Earth (Zahnle, 2007), and thus, the speed of the asteroids receiving a gravity boost would have been greater and the Moon would have presented a bigger target than at the Moon's current position. containing the Moon with its own Sphere of Influence. A roller coaster analogy may be appropriate. Without propulsion, a roller coaster drops from one hill and increases its speed until it reaches the bottom. Then, its speed slows down as it climbs to the second hill of equal height where, in a frictionless system, it would have the same speed as it had at the top of the first hill. However, if the roller coaster were to crash halfway up during its climb to the second hill, the impact would be much greater than if it crashed at the top of the hill because halfway up it has greater speed. Using the University of Arizona's online calculator for Computing Crater Size from Projectile Diameter (Melosh and Beyer, 2000), we can calculate that a rocky asteroid with density of 3000 kg/m3 and a diameter of two kilometers traveling at 17 km/sec would make a crater with a diameter of 53 km on a similarly dense lunar surface striking at an angle of 90 degrees. The same asteroid traveling at a speed of 45 km/sec would make a much larger crater with a diameter of 88 km, which is approximately the size of the Tycho crater. Knowing the approximate speed at which gravity-assisted asteroids impacted the Moon makes it possible to estimate the size of the impactors that created the lunar maria. Using the University of Arizona's online calculator for Computing Projectile Size from Crater Diameter (Melosh and Beyer, 1999), we can estimate that an asteroid with a diameter of 18.2 km traveling at 45 km/sec could have created the Sea of Serenity (Mare Serenitatis) which has a diameter of 674 km (Gazeteer database), see Figure 4. Using the same parameters, Mare Humorum with a diameter of 419 km could have been created by an asteroid with a diameter of 10.9 km, and Mare Imbrium, which is one of the largest maria with a diameter of 1145 km, could have been created by an impactor with a diameter of 32.4 km. Asteroids traveling from the asteroid belt toward the Moon in Quadrant III and Quadrant IV would generally impact the far side of the Moon because the near side would be facing the Earth and the asteroids would be coming from outside the Earth-Moon system. These impacts, as well as any impacts in Quadrants I and II not influenced by the gravity of the Earth would occur at the typical asteroid velocity of 17 km/sec. The computation of the projectile sizes that created the maria depends on the speed of the impactors. Mare Serenitatis could have been created by a stony asteroid with diameter of 18.2 kilometers traveling at 45 km/sec or by one with a diameter of 25.6 kilometers traveling at 24.7 km/sec. Similarly, Mare Humorum could have been created by an asteroid with diameter of 10.9 kilometers traveling at 45 km/sec or by one with a diameter of 15.3 kilometers traveling at 24.7 km/sec. The mascon gravity data published by Sjogren and Wollenhaupt (1972) was used to determine whether the mass of the impactor could be correlated with a substantial portion of the positive gravitational anomaly of the mascon. Sjogren's calculation of excess mass for Mare Serenitatis and Mare Humorum yields 15×10-6 and ~7×10-6 of the total lunar mass, respectively. This corresponds to approximately 1.1×1018 kilograms for Mare Serenitatis and 5.0×1017 kilograms for Mare Humorum. Even for the larger asteroids with lower speeds, the masses of the projectiles account for one percent or less of the mascon masses. It may not be possible to determine the initial mass of the impacting asteroids from today's gravity anomalies, but the calculations make it necessary to conclude that the creation of the mascons required the rebound of the cavity floor (Settle and Head, 1979) or a subsequent geological process to bring denser material closer to the surface. 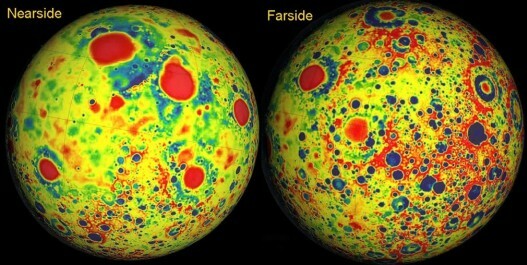 NASA's Gravity Recovery and Interior Laboratory (GRAIL) mission from March to May 2012 produced very accurate gravity maps of the Moon that show the mascon areas. The mass concentrations form concentric patterns with increased gravity at the center of the impact surrounded by a ring of lower gravity and an outer ring of gravity surplus. This bull's-eye pattern arises as a natural consequence of crater excavation, collapse and cooling following an impact. Hydrocode simulations by Melosh, et al. (2013) indicate that the intermediate rings with less gravitational pull were created when the rigid lunar crust that slid into the craters of the impacts prevented the material from fully rebounding to its original surface height. The outer ring of increased gravitational pull was formed from the added mass of the material ejected by the initial impact that piled on top of the lunar surface. The GRAIL findings provide support for the impact origin of the lunar maria. This paper postulates that the lunar maria on the near side of the Moon could have been created by impacts from asteroids whose speed was increased by a gravity boost from the Earth. Since the Moon is tidally locked to the Earth, asteroids hurled from the direction of the Earth impact only the near side of the Moon that always faces the Earth. The high energy impacts could have triggered magmatic flows that created the maria at a time the Moon still had a molten center. Asteroids impacting the Moon in Quadrant III or Quadrant IV struck mainly the far side of the Moon at the usual asteroid speeds of 17 km/sec. The sphere of influence (SOI) is the sphere-shaped region around a celestial body where the primary gravitational influence on an orbiting object is that body. Where a is the semimajor axis of the smaller object's (usually a planet's) orbit around the larger body (usually the Sun). m and M are the masses of the smaller and the larger object (usually a planet and the Sun), respectively. Barricelli, N.A. ; Thorbjornsen, R., 1978, Distribution of lunar impacts by objects in parabolic low inclination orbits, The Moon and the Planets 18, 479-490. Cameron, A. G. W.; Ward, W. R. (March 1976). "The Origin of the Moon". Abstracts of the Lunar and Planetary Science Conference 7: 120–122. Cohen, B.A. ; Swindle, T. D.; Kring, D. A., 2000, Support for the Lunar Cataclysm Hypothesis from Lunar Meteorite Impact Melt Ages. Science, v. 290, no. 5497, 1 p. 1754-1755. Gilbert, G. K.: 1893, Bull. Phil. Soc. Wash. 12, 241-292. Hartmann, W. K.; Davis, D. R. (April 1975). "Satellite-sized planetesimals and lunar origin". Icarus 24 (4): 504–514. Ivanov B.A., Melosh H.J., 2003, Impacts do not initiate volcanic eruptions: Eruptions close to the crater: Geology, v. 31, p. 869-872. Melosh, H.J; 2011, Planetary Surface Processes: Cambridge Planetary Science. Parmentier, E.M.; Zhong, S.; Zuber, M.T., 2002, Gravitational differentiation due to initial chemical stratification: origin of lunar asymmetry by the creep of dense KREEP? Earth and Planetary Science Letters 201 473-480. Peale, S.J., 1977, Rotation histories of the natural satellites, in J.A. Burns, ed. Planetary Satellites. Tucson: University of Arizona Press. pp. 87–112. Peterson, C. A.; Hawke, B. R.; Lucey,P. G.; Taylor, G. J.; Blewett,D. T.; Spudis, P. D., 1999, The Distribution Of Anorthosite On The Lunar Farside, Workshop on New Views of the Moon II. Settle, M.; Head, J. III (1979), The Role of Rim Slumping in the Modification of Lunar Impact Craters, J. Geophys. Res., 84(B6), 3081-3096. Sjogren, W. L.; Wollenhaupt, W. R.,	1972, Gravity: Mare Humorum, The Moon, Volume 8, Issue 1-2, pp. 25-32. Smith J. V., 1970, Proc of Apollo 11 Lunar Sci Conf, 1, 897 - 925. Thurber, C. H.; Solomon, S. C., 1978, An assessment of crustal thickness variations on the lunar near side - Models, uncertainties, and implications for crustal differentiation, Lunar and Planetary Science Conference, 9th, Houston, Tex., March 13-17, 1978, Proceedings. Volume 3. (A79-39253 16-91) New York, Pergamon Press, Inc., p. 3481-3497.
van Allen, J.A., 2003, Gravitational assist in celestial mechanics - a tutorial, American Journal of Physics, Volume 71, Issue 5, pp. 448-451. Wasson, J.T. ; Warren, P.H., 1980, Contribution of the mantle to the lunar asymmetry, Icarus, Volume 44, Issue 3, December 1980, Pages 752-771.